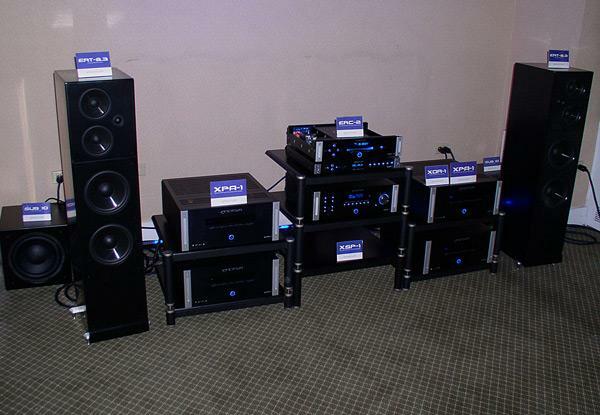 The New York Axpona Show came together on very short notice. 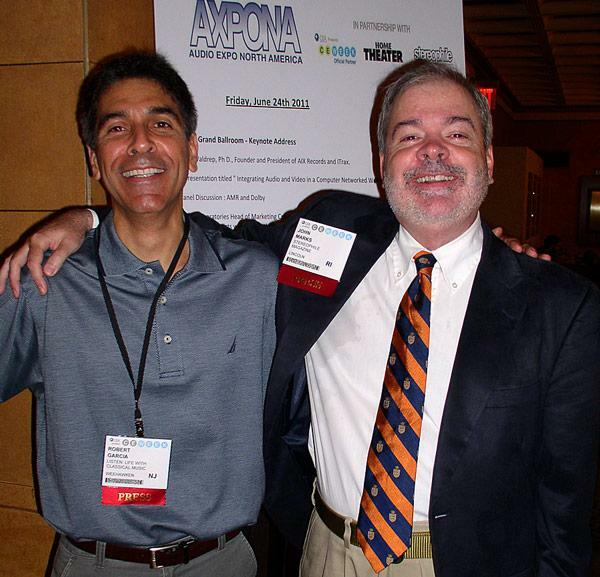 It was announced to the industry and press on the penultimate day of the Atlanta Axpona, which took place in mid-April. As I understand it, the Show's genesis was the Consumer Electronics Association (CEA) thinking that it would be a good idea to add high-end audio consumer days to their annual CEWeek in New York. This is a "line show," where big electronic companies show their fall product line-ups to the press. 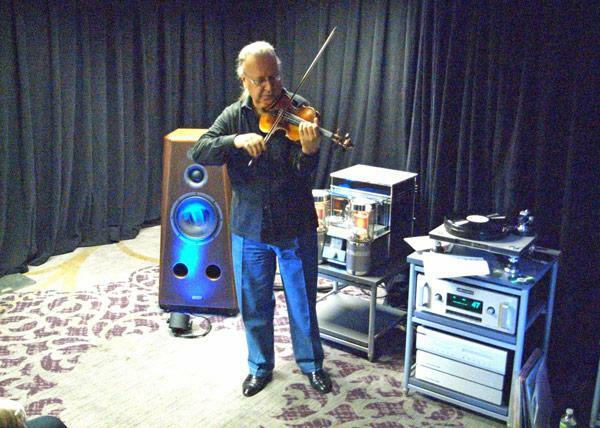 Accordingly, CEA partnered with Axpona's Steve Davis to organize the high-end show, with marketing support being given by Stereophile and Home Theater magazines. Two months is not much time to organize a large show and possible exhibitors would already have their promotional budgets fixed. So it was no surprise that there was only a limited number of exhibitors at the Show: 22 rooms (not including software vendors) representing 72 individual brands on three of the hotel's floors, plus a mezzanine. 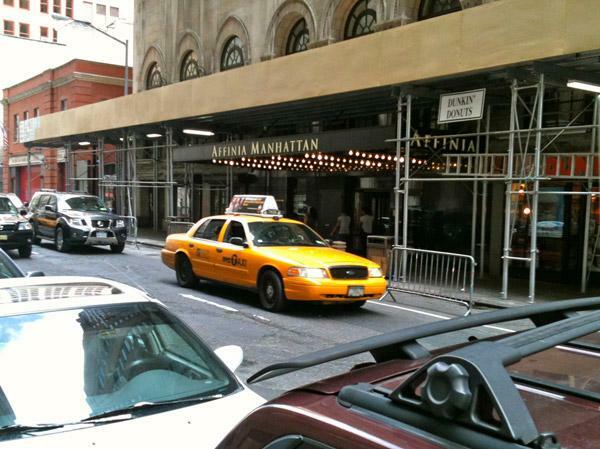 The show took place at the Affinia Hotel. . .
Best sound apart from violinist Arturo Delmoni, that is. I am reviewing TAD's Compact Reference CR-1 three-way stand-mounts ($37,500/pair plus $1800/pair for stands) for a Fall issue of the magazine so I was interested in seeing what kind of sound TAD's chief engineer Andrew Jones was getting from the CR-1s in the room TAD was sharing with its New York dealer, Triode Picture+Sound. 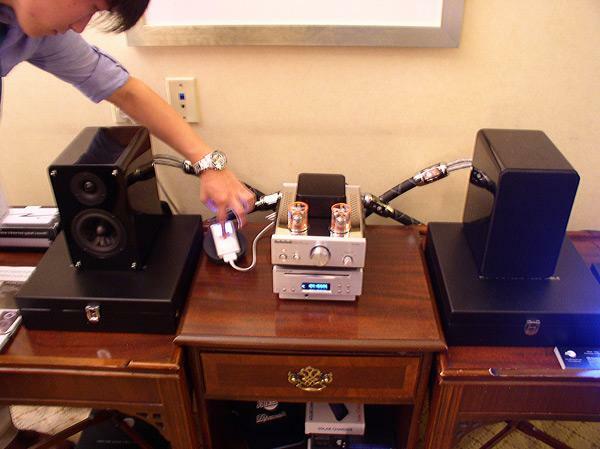 Though there were a pair of Atma-Sphere tube monoblocks in the room, the speakers were being driven by TAD's solid-state amplifier with the source Andrew's MacBook Air running Decibel and feeding data to a TAD DAC via USB. I listened to several hi-rez recordings at 176.4kHz and 192kHz from Chesky and ex-Sheffield Labs engineer Bill Schnee, whose recording for Bravura Records of a band led by drummer Simon Phillips had one of the best recorded drum sounds I have heard. Even in the cramped and crowded hotel room, it was obvious that these speakers, with their coaxial, beryllium-diaphragm midrange/tweeter and reflex-loaded 8" woofer with a 4" voice-coil, were doing something out of the ordinary with respect to freedom from compression. It was déjà vu all over again when I went into the MBL room at Axpona (after a wait in the corridor outside, this room being packed throughout the Show). The system was the same used at SSI in Montreal and Axpona in Atlanta last April101E Mk.2 omnidirectional speakers driven by gigantic 9011 monoblock amplifiers, a 6010D preamp, a 1621A CD transport, and a 1611F D/A converterbut this time with everything finished in a superb gloss white. I listened to "Fit Song" from Cornelius's Sensuous CD, "The Boy in the Bubble" from Peter Gabriel's Scratch My Back CD, and the hi-rez solo piano recording made by MBL's long-time chief engineer Jürgen Reis, "Walchensee, Mondnacht," performed by Martin Vatter, from the album Klangbilder. All the music was being played from a Linux music server put together by MBL's Jeremy Bryan and fed via an asynchronous USB link to the MBL DAC. The room was a little on the small side for the speakers, with their extended LF response and omnidirectional highs, but that aside, the sound rocked, with an enormous and well-defined soundstage drawing me into the music. The line outside the AIX room at Axpona, like the line outside the MBL room, was evidence that something special was happening inside. 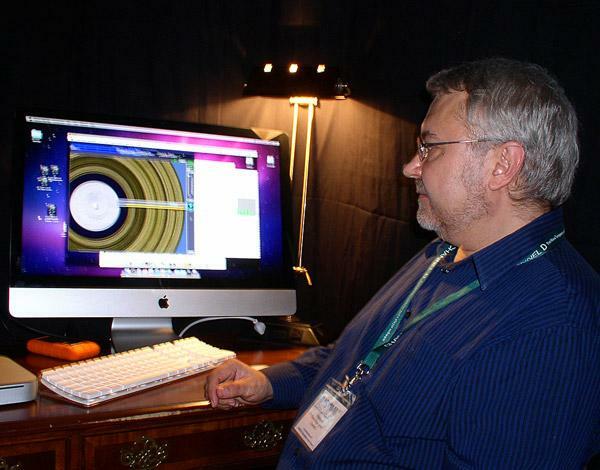 Mark Waldrep of AIX Records prefaced his AV demonstration with an interestingand amusingdiscussion of how difficult and expensive it can be to film in 3-D. There followed one of the most convincing performance clips I've yet to see: fingerstylist Laurence Juber playing a number called "White Pass Trail" on his signature Martin guitar. During the second part of this instrumental, Juber switched from mere picking to actually slapping the strings over the guitar's fingerboard extension (slapping the body, too, for percussion), and the five Thiel SCS4T loudspeakers ($3690/pair) captured perfectly the speed and impact, along with the color and texture, of those sounds. 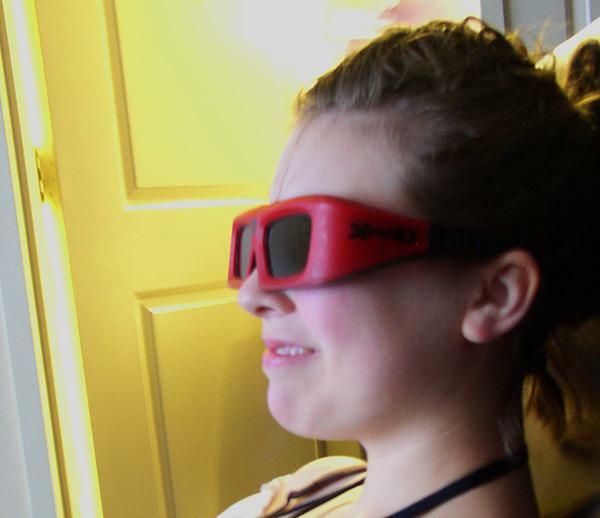 By this time of the show my wife had joined my daughter and I, and she shared my surprise at how the 3-D effect enhanced, rather than tarted-up, the performance. An impressive recreation of superb music. May Audio Marketing's Nabil Akhrass (seated) was even busier than usual at this show, given the absence of his sister, Julia: She recently gave birth to her and her husband's first child (congratulations! ), and decided to sit this one out. When I visited the May Audio exhibit on Saturday morning, they were already enjoying brisk sales of CDs and vinyl. 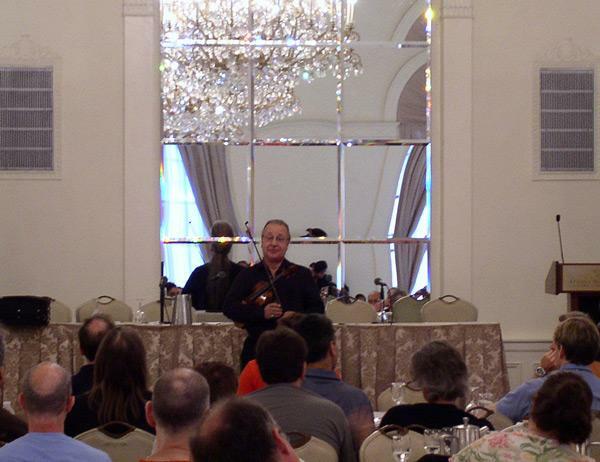 JA was sitting at the back of the ballroom and was surprised by how loud the sound of the solo violin was. Whipping out his iPhone with the Studio Six Digital SPL Meter app, he measured the typical sound pressure level at 72dB(C). Speaking of the devil: Here's JM himself (right), posing with Arkiv Music's Robert Garcia, who is also associated with that company's classical music quarterly Listen. John Marks also arranged, courtesy of Audio Power Laboratories and Wharfedale, to present Arturo Delmoni performing the slow movement from Karl Goldmark’s Concerto for Violin in their room. Arturo played live, but Steve Martorella playing his transcription for pipe organ of the orchestral part was recorded by John Marks in the First Baptist Church in America and played back from CD over the Wharfedale Neo Airedale speakers. The result was impressive, both on the grounds of the system’s sound quality, with extended low frequencies demanded by the organ, but also for Dr. Delmoni’s lyrical virtuosity. This wasn't so much Live vs Recorded and Live with Recorded. 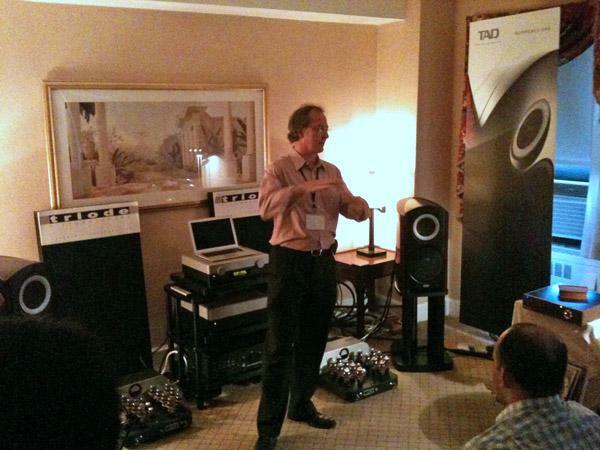 We all owe John Marks a big "thank you" for bringing live music to Axpona New York. A challenge for the journalist who can’t read his own notes (that would be me): The need for information regarding the Mark Neumann loudspeaker shown above led me to the world-wide web, but a Google search on the words Mark Neumann returned mostly hits that had nothing to do with audio and everything to do with politics. (It was a little like reading one of my old columns. But just a little.) 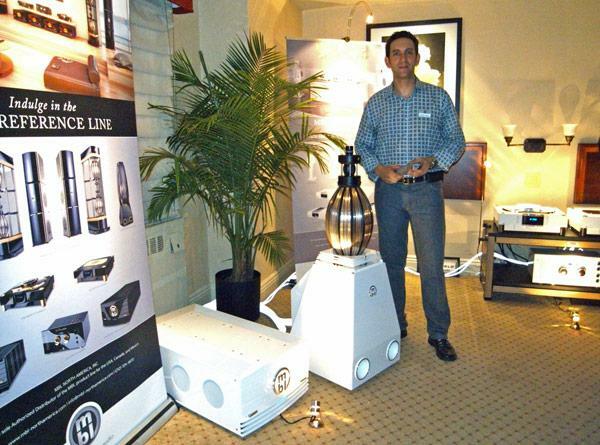 I returned to my senses and visited the website of Miami’s High End Palace, the Axpona exhibitor that brought the mighty Coliseum XLS loudspeaker (approximately $40,000/pair) to New York, and learned that this open-baffle speaker’s design was inspired by a concert grand pianoand that only 12 are made each year. Fed by a Stahl-Tek CD player and driven by Tact and BAT electronics, the Coliseum XLS sounded impressive in a number of ways, although its considerable bass response tended to overwhelm the smallish room. The sign on the door said JIB Germany, leading me to expect…well, something very different from what I found. (As the late Vivian Stanshall declared in a Bonzo Dog Band number titled “Shirt”: ‘24-Hour Cleaners’? That’s just the name of the shop, dearie!) That said, the exhibitors in this room demonstrated a pleasant-sounding mini-system, comprised of a Napa Acoustics NA-208A hybrid tube integrated amplifier ($399) and NA-208S two-way loudspeakers ($199/pair), fed by a first-generation iPod playing Abba songs. Hand not included. I tried but failed to photograph the on-screen image from the home-theater dem in one of the two Emotiva rooms, so you’ll have to take my word: Eric Clapton wore a black short-sleeved shirt and a pair of ripped and faded jeans (shame how some of these rock stars just frittered away their millions), and played a baby-blue Fender Stratocaster. But the real stars of this slick and commendably spare-sounding band were the three backup singers, who were sufficiently passionate to convince me that they had, working together, indeed murdered a sheriff somewhere. 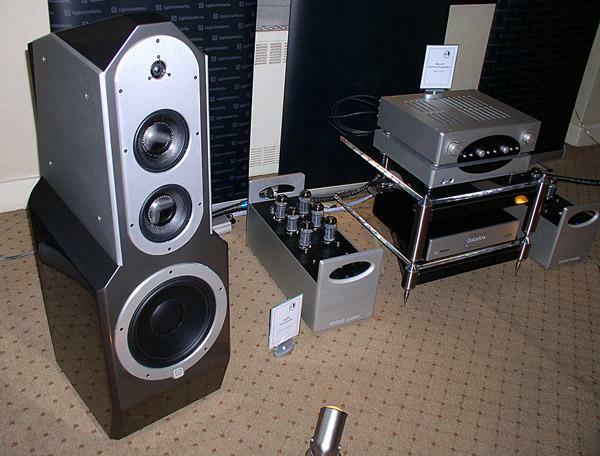 The excitement of it all was delivered by Emotiva electronics and loudspeakers, including XPA-2 and XPA-5 amplifiers ($679 and $764, respectively), UMC-1 surround-sound processor ($594), ERT-3 floorstanding loudspeakers ($1278/pair), and ERD-1 stand-mounted surround speakers ($319/pair). The sound was quite decent by any measureand exceptionally good for the money. It’s okay to like R.E.M. again, and not just because their latest single (“Uberlin”) is the band’s best in over a decade: In the exhibit sponsored by EgglestonWorks and Rogue Audio, R.E.M.’s “How the West Was Won and Where it Got Us” sounded so good and so clear and so utterly fresh that I literally did not, at first, recognize the music. The combination of Rogue Hera II preamplifier ($7995) and Apollo monoblock amplifiers ($10,995/pair) plus Eggleston Andra III loudspeakers (ca $24,000 per pair) contributed to my wondering if the album from which that single sprung1997’s New Adventures in Hi-Fimight be better than I thought. I guess I’ll give the LP version another try (although I maintain that NAIHF represented the very nadir of the group’s covert-art pretentiousness). The Axpona experience renewed, in particular, my admiration for Rogue Audio’s persistence in making superb tube electronics at sane, fair prices. 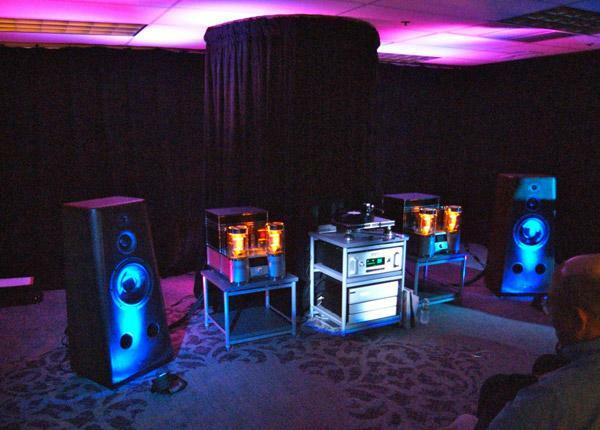 Art Dudley mentioned earlier in this show report the Audio Power Laboratories tube monoblocks driving Wharfedale's new Neo Airedale flagship loudspeakers ($25,000/pair). 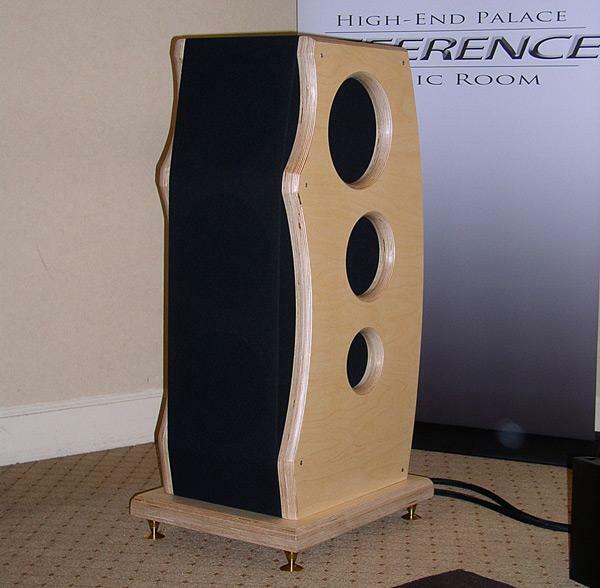 Source was a Musical Fidelity CD player, preamp an Audio Research, and the sound in this room was indeed one of the best at Axpona: extended lows, clean highs, and impressive dynamic range. During the half-hour Julia and I spent visiting Channel D Software's Rob Robinson, the room never ceased to be mobbed with attendees. That was partly due to the good sound (provided by Joseph Audio Pulsar speakers, Hegel H20 amp, Artemis record player with Zu cartridge, and Audio Research DAC8plus, of course, a Synology NAS and a brace of Apple computer gear, driven by Channel D software), and partly to the fact that the exhibit was like a free seminar on both the basics and the minutiae of computer audio, with Robinson as the generous instructor. Channel D's Pure Music 1.8 ($129) is now available, and I hope to try it soon after returning home. Bright red Totem Mani-2 loudspeakers, glimpsed through an open door, drew Julia and I into the Amsterdam Room, where products from D-Box Technologies, Digital Projection, Audio Design Associates, Stewart Filmscreen, and Totem were combined to create an exceptionally impressive 3-D home theater demonstration. Leather lounge chairs from Design NS had been equipped to convey a sense of motion to their users' posteriorspresumably these remain perfectly still during most Merchant Ivory filmsso we felt as well as saw as well as heard the action during excerpts from Avatar and The Owls of Ga'Hoole. Julia's face says it all.